Over ten years after his popular but controversial television adaptation of Oliver Twist, acclaimed BAFTA Award winning writer Alan Bleasdale (G.B.H. ; The Monocled Mutineer; Boys From The Blackstuff) makes a long overdue return with The Sinking of The Laconia, a powerful two-part wartime drama telling an epic story of the unexpected gallantry and amazing heroism shown by ordinary people in the face of extraordinary adversity. Directed by Uwe Janson and based on true events that took place during World War II, The Sinking of The Laconia features an international cast of actors that includes Brian Cox, Lindsay Duncan, Ken Duken, Andrew Buchan, Franka Potente, Matthias Koeberlin, Frederick Lau, Thomas Kretschmann, Jodi Balfour and Morven Christie. 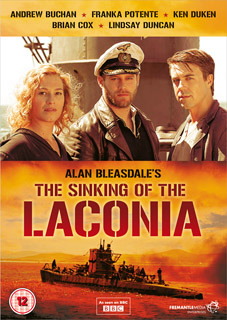 The Sinking Of The Laconia will be released on DVD by Fremantle Media Enterprises on 14th March 2011 at the RRP of £15.99. Special Features include the 30-minute documentary The Sinking Of The Laconia: Survivors' Tales.